Klasicky excelentní hudebníci, jimž není rovno a turné pilně a bez oddychu jezdící kámoši. To jsou italští epicko-techničtí brutaldeath metalisti HOUR OF PENANCE, kteří prorazili s 'Vile Conception' z roku 2008, což bylo jejich třetí album a první pro kultovní americký deathmetalový label UNIQUE LEADER. Světu spadla čelist, když chytli ten zuřivý, na přesnosti založený styl kapel jako HATE ETERNAL a ORIGIN za koule a zakroutili s ním, až mu slzy tekly. Páté album 'Sedition' vydané v březnu roku 2012 u PROSTHETIC records je jen další vystupňování jejich neustálé války proti náboženství a upocené připosranosti. A další bojiště této války? OBSCENE EXTREME 2013!!! Death metal is more than just music. It transcends such a limited mortal state of mind. Death metal is the aural expression of humanity's darkest side, of devastation, sorrow and the harbingers of mankind's own inhumanity & ultimately it's destruction. Death metal is not a trend, a fashion parade or a means to an end. It is much more than that. It is a way of life. A life in death. This is the doctrine HOUR OF PENANCE spew forth with unrelenting musical verocity through their sickening, mind-obliterating auditory assault on the senses. Forged in the dark shadows of "The Holy Capital", this most unholy of quartets have steadily been making a name for themselves as one of the most intense, talented and impressive, both in the studio & live onstage, modern death metal bands around. These tyrannical troubadors of brutality have so far spread their plague of destruction across the breadth of the European continent and the U.S soil touring with bands such as Cannibal Corpse , Deicide , Nile , The Black Dahlia Murder , Origin and many others. 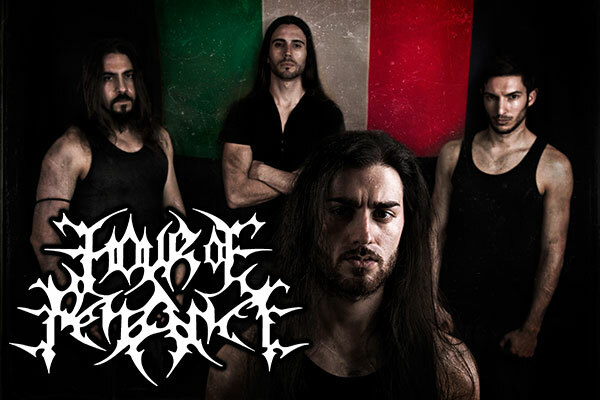 Countless venues across the continent have witnessed the slaughter each time these Italian stallions take to the stage. HOUR OF PENANCE are one of those few bands who not only manage to harness the tools of intense brutality in the studio and on record but translate that so perfectly into the live arena too that the poor gathered public is subjected to an even more visceral display than anticipated! With each release unleashed upon the masses HOUR OF PENANCE have continued to hone their finesse yet further, progressively managing to not only ratchet up the aural intensity of their music but also the sheer technicality, musicianship and calibre required to be able to withstand such increasing potentcy. The year 2008 saw the release of the band's most lauded album to date, 'The Vile Conception', which was thirty-six minutes of ferocious brutality played with a precision targeted attack on the senses, and which earned the band high praise from the music press and the thousands of those who heard it, including CANNIBAL CORPSE's very own Alex Webster who listed it as one of his favourite top five! Now, just when you thought it was safe to listen to call yourself a death metal fan, and with the impending unleashing of their most potent conjurations thus far, HOUR OF PENANCE are poised to strike & devastate the ears of the loyal disciples of death metal once more with a merciless masterclass in brutality entitled 'SEDITION' brought into inception at the legendary 16th Cellar Studios in Rome. Unleashing a likely tour de force in maniacal death metal brutality, a celebration of music in it's darkest and most inhuman form, HOUR OF PENACE have ascended to an even greater height of precision savagery. Every population has its cancer, every movement its enemies. Be the wolf amongst the flock. Embrace the barbarity!